When you see Mario on the shelf at the store next to a row of Yoshi and Donkey Kong friends, it makes you want to buy it. Right then & there. It looks awesome. Officially licensed with Nintendo, this is a very accurate representation of the video game hero. The finish is very good, and the arms and head are poseable for extra fun. When it's moving, the exhaust mufflers even light up in a really cool way. 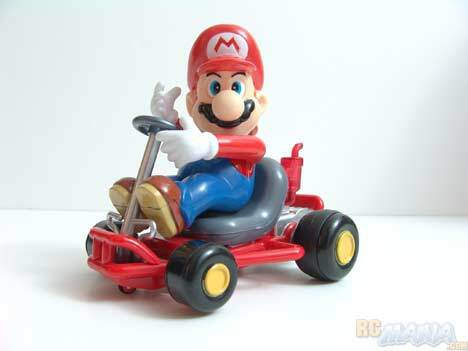 NKOK makes three versions of each Nintendo go-kart. This one here is the simplest, made for the youngest kids. The controller has just two buttons, and the controls couldn't get any more basic. It either goes forward or turns one way automatically when in reverse. 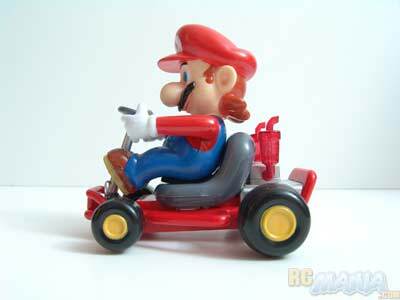 The front wheels actually don't touch the ground -- there's a tiny wheel on the bottom of the kart, right under Mario's feet, that holds the whole front end up and moves somewhat like a shopping cart caster when in reverse, to make the whole thing change direction. There's really no setup as everything is fully assembled. Just add batteries and you're good to go. The controller may be a little large for a 6-year-old kid (the minimum recommended age). Also, the buttons seem a bit hard to push. You actually have to pay attention to where on each button you apply pressure. The forward button wanted to be pushed at the very bottom. The reverse button wanted to be pressed more on the right. That was a bit on the annoying side. I was happy to see that Mario actually moved decently fast, but not too fast to control. It looks even cooler when moving than standing still! Once I tried to go backwards & turn, though, there was a major problem. It went backwards, but it didn't turn. I checked the little hidden wheel that's made for steering, and it was rolling and moving quite easily. On the linoleum kitchen floor I was driving on, there just wasn't enough resistance to encourage the wheel to move to the side, so it just rolled straight whether going forward or backwards. Alright, the kitchen floor was too smooth, so I thought I'd try the living room. My carpet is "medium pile," not too soft, not too hard, not to tall. The kart really struggled to drive over this. The little front wheel just kept getting stuck. I tried the garage, which has a sealed concrete surface. This was too smooth, just like the kitchen. On a sidewalk I got better luck, but everytime I went over one of the seams / lines in the concrete, I would risk getting stuck. 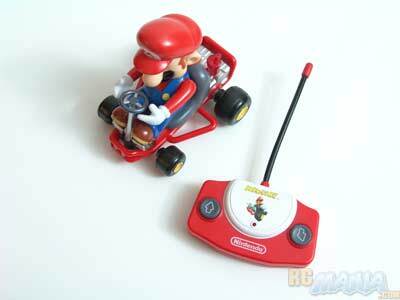 Unlike in the Nintendo game, it seemed like there was just no way to win with this RC kart! What gives? I have to wonder whether this little thing will drive right and consistently anywhere other than the office of the designer who created it. I think it needs a very "low-pile" (short), hard, dense carpet that's not too bumpy to work properly. If you don't have this perfect surface, you're going to be out of luck just like I was, I fear. I really wanted to give this vehicle at least a D because it looks so cool, but it costs too much to be worth buying just to set it on a shelf to look at. I'm looking forward to a MUCH better experience (I hope) with the advanced version of this kart that has full forward/back left/right control. Be on the lookout for that review.